Why Wayne Simmonds is a perfect fit for the Stars - The Point Data-driven hockey storytelling that gets right to the point. As we get closer to the trade deadline, teams out of the playoff mix have to start thinking about which assets they’re willing to move and which ones they wish to keep. One of the most common trade bait players the last couple of trade deadlines has been Wayne Simmonds. 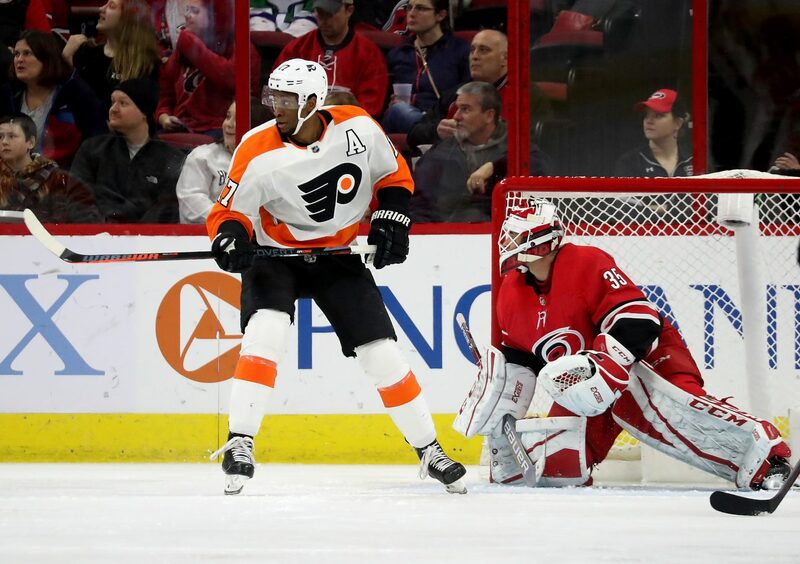 A big bruising winger with a scoring touch and a cheap expiring contract is a widely sought after asset and the Flyers need to decide what kind of future they wish to have with Simmonds. Simmonds is in line for a hefty raise and is doing his part this season to earn it. His 13 goals and 19 points this year have him on pace for 24 goals and 36 points. This would be his lowest point total since joining the Flyers in 2011 but would also give him his sixth straight 20 goal season. All while being on the 25th ranked team in goals for. Simmonds showed exactly what makes him so valuable during last nights 5-3 loss to the Washington Capitals. He spent most of the game battling away in his office, making his presence felt in front of Phoenix Copley as often as possible. The Flyers put 6 shots from the inner slot on net and Simmonds shot every single one of them, which included their second goal of the night. You can bet GM’s around the league had their eye on him last night and Chuck Fletcher was probably ecstatic about his performance. What Simmonds brought last night is what any team should expect to see from him on a regular basis. 11 of his 13 goals have come from the inner slot and only one of his goals has come from outside the slot. Simmonds understands where he’s most effective and sticks to it, ranking 5th in inner slot shots. He’s averaging a shot distance of 22.7 feet this year and his goals have come from an average of 8.1 feet. When you consider that the crease extends out 6 feet from the goal line it means Simmonds average goal is from 2 feet outside the crease. So, what team could use a productive net-front forward? My pick is the Dallas Stars. Sitting in third in the central, the Stars still have a lot of flaws. One of which is that they’re one of the worst teams in the NHL when it comes to getting shots from the inner slot. Having Wayne Simmonds parked there and forcing goalies to deal with him on a constant basis would add an extra element to their attack. The Stars attack needs another element to it. Only their big three of Jamie Benn, Tyler Seguin, and Alexander Radulov have double-digit goals. They need added depth and Simmonds’ 13 goals would do that. He would give them the secondary scoring they haven’t had in years. The Stars have just under a million in cap space left but would only need to pay out the rest of his salary for this season. At worst, the Flyers could retain some salary since he’s on an expiring deal. If the Stars expect to be competitive in the playoffs they need to make this move to create some scoring depth.